Early in the new year, I received a text from someone, asking if I had read City of Bones by Cassandra Clare. She had been given the book for Christmas and ploughed through it, before wanting to share with me. I find it difficult to ignore recommendations, and must read a book quickly if it’s loaned to me. So, the multiple unread books on my shelf were temporarily forgotten as I plunged into the young adult fantasy book. I found it to be an easy read. It grabbed me early and had some cool themes and ideas such as motorbikes which run on demon energy. The characters were well formed although as usual, I found myself cheering for the nerdy outsider. The scene set-up was also really good so I felt I was in the middle of it. 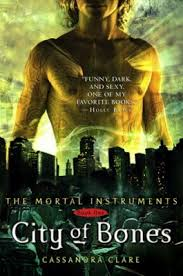 The City of Bones seemed to be influenced by several other young adult novels. I found bits of Harry Potter and even a little Star Wars cropping up within the covers. And while I was easily able to get into the world, I didn’t get the feeling of being completely absorbed in it. It can’t be all that bad though; my next task will be to check the prices of the rest of the series on Amazon. Let’s hope the next books pulls me in a little further.